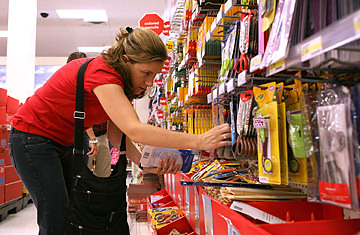 A teacher shops for back-to-school supplies at Target in Daly City, Calif. Kids won't be the only miserable people during these waning days of summer, when the first day of school lurks like a dour detention officer. The retailers selling students back-to-school clothing, supplies and gadgets will be pretty sad souls too. According the National Retail Federation, the average family with K-12 students will spend $548.72 on school merchandise, a 7.7% decline from 2008. Britt Beemer, founder and chairman of America's Research Group, a retail consulting firm, predicts spending will drop from 8.5% to 12.5% this year, compared with a 5% fall last year. "In my 30 years of tracking this, we've never seen two straight year of declines," says Beemer. "It's pretty bad." Back to school is the second most important season for retailers, behind the December holidays. According to a survey conducted by Beemer, more than half of American parents are trying to get their children to recycle the clothing they wore last year, summer growth spurts not withstanding. More parents are also controlling the purse strings and moving down-market for pants and shoes. Nearly 45% more consumers say they will shop at Wal-Mart for back-to-school items this year, according to Beemer's survey, and Sears picked up 33.3% more shoppers. "A lot of moms and dads are going to be buying back-to-school clothing in places their kids don't want to go," Beemer says. That's just what America's education system needs: more teens stewing about their cheap jeans during chemistry class. Apparel isn't the only thing that will take a hit. Back-to-school shoppers plan to buy less of the basic stuff that students really need. The National Retail Federation forecasts that spending on notebooks, folders, backpacks and lunch boxes will fall 16% this year. Analysts predict that electronic items like personal computers will also see a sales decline. "We expect that it's going to be a disappointing season," says Ashok Kumar, tech analyst at Collins Stewart, an advisory firm. Kumar points out that life cycles of desktop computers are stretching from four years to as much as six years; laptops used to last about three years; now consumers are getting an extra year out of them. "Parents are asking kids to make use of existing resources, just like companies," Kumar says. Over the past four years, Beemer has asked consumers which type of electronics item they would be most likely to buy for their children for school. Computers were the most popular item every time. This year, the most popular item was calculators, which makes sense. They're cheaper, and a tool for parents who want to teach their kids to be budget-conscious bean counters. Of course, bad news for retailers is usually good news for consumers, and back-to-school shoppers should expect sweet deals designed to get them in stores. Retailers are still desperate to reverse their fortunes in a down economy. However, consumers shouldn't be as giddy as they were, say, six months ago, when stores were running 70% clearance sales to shed their excess holiday inventory. Stores have wised up a bit and cut inventory levels to match the slack in demand. So while retailers may offer lean discounts, we're beyond the slash-and-burn era. "Consumers are going to see moderately priced value offerings," says George Whalin, president of Retail Management Consultants. "The really, really deep mark-downs aren't going to happen this year." So if you really want to save, follow the lead of Jessica Montero, an administrative assistant from the South Bronx with a son who is entering ninth grade. Montero's work hours and income were cut earlier this year, so she is swearing off Staples and buying all her son's school supplies at a discount store. Her son's private school requires a uniform, but instead of buying an overpriced ensemble directly from the school, Montero plans to go to Target to patch the outfit together for half the price. She also cut off her son's cell-phone service four months ago and won't be restoring it for the school year. "I can't afford to get him the new style all these teenagers are into these days," Montero says. "He's been bugging me for it, but it had to end. We're just in a time of major cutbacks." Fewer kids texting on their cell phones during class? No one said the back-to-school recession didn't have its benefits. See pictures of the college dorm's evolution. See TIME's special report on paying for college.